George Woltman was born in November 1957 and became interested in number theory at the age of six. George graduated from MIT with a BS and MS in Computer Science in 1978. He worked on operating systems for Data General in R.T.P., N.C. until 1981. From 1981 to 1986, he worked on ALLY, a 4GL for a small company in Cary, N.C. In 1986, co-founded Q+E Software which developed database access tools for Microsoft Windows. 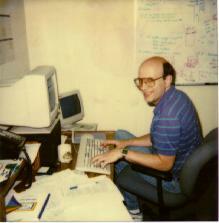 In 1994, moved to Orlando, FL, where he works for Just For Fun Software. He is married to the lovely Jan Woltman for 10 years. George began the GIMPS project in early 1996 which found their first Mersenne prime later that year.